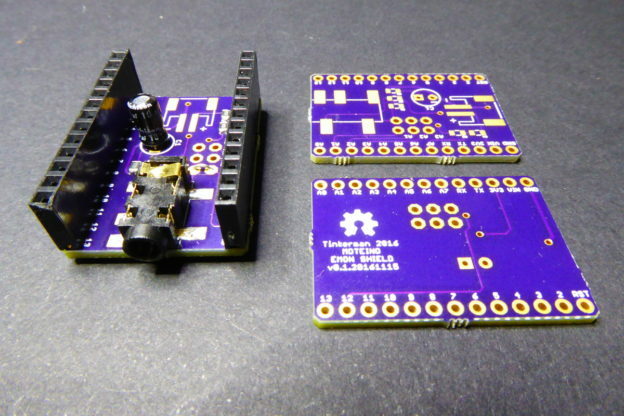 Tindie is a great place to find uncommon electronic components or weird/interesting boards. I use to stroll around it’s products to basically see what’s new. It’s like Kickstarted but for real. One such uncommon and new electronic components is the Panasonic’s Grid_EYE AMG88 [datasheet, pdf] infrared sensor. 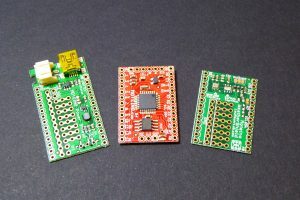 And I first learn about it through Peasky Products breakout board at Tindie. And if you have been reading me lately you might know I’m going through my own LED fever. My latests “sliced” projects are not the only ones I’m working on at the moment. 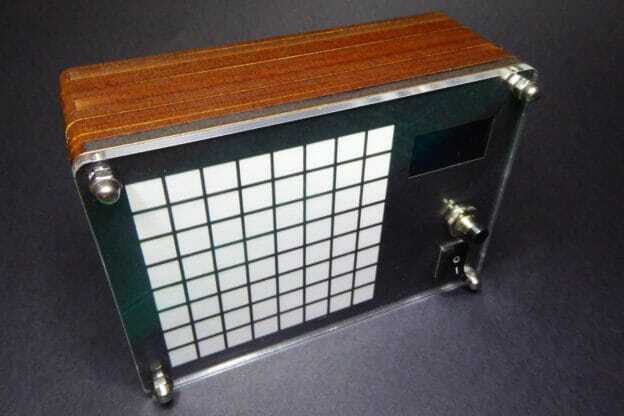 So it was not surprise my brain immediately linked an 8×8 IR array with an 8×8 LED matrix display. You see? So what do you have if you throw in a box an IR sensor and a LED matrix, add a small microcontroller, a LiIon battery and a charger and a step-up to power the LEDs? Well, in my case the outcome has been a bulky but nice camera (albeit a very poor resolution one). I know there are commercially available IR Cameras like this one [Ebay]. They have 300k pixels and can overlay a normal image over the IR image and other fancy stuff, but they are also more expensive (around 200€ the best deal) and waaaaaay less fun to build. This entry was posted in Code, Projects, Tutorial and tagged amg88, amg8833, arrow electroics, farnell, ftdi, github, grideye, hoperf, i2c, ir, led matrix, lipo battery, mcp1703, moteino, oled, openscad, oshpark, panasonic, pibow, pimoroni, platformio, pololu, pure engineering, rfm69, seeedstudio, slices, tindie, tp4056, ws2812 on May 29, 2017 by Xose Pérez. 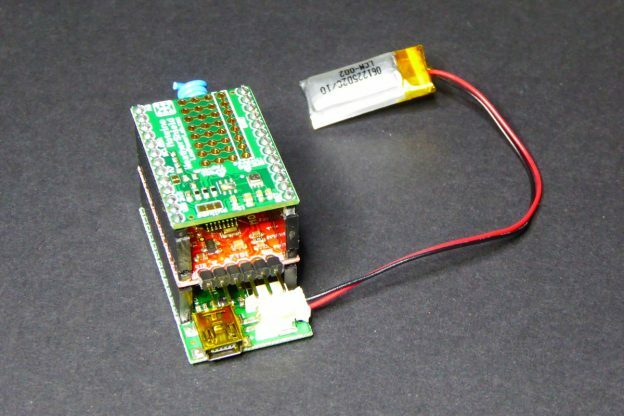 Moving from the ESP8266 world I’ve been diving lately I still love the simplicity of battery powered Moteino nodes. You might know I’m migrating my XBee-based sensor network at home to an RFM69 one. So long I have changed my door monitor and my weather station. 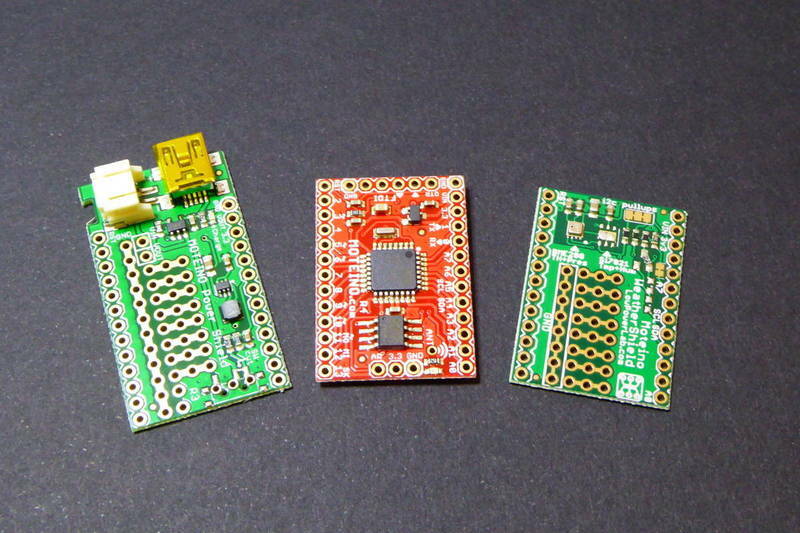 They are sensing and reporting to my RFM69GW, an ESP8266 bridge board using a custom firmware. Time to go for the power monitor. A long time ago (actually 2 years but it really feels like a century ago) I was living in a big city and we had one of those fancy “smart meters” with a LED pulsing 4000 times every kWh. Back then I used an Arduino micro to count the LED pulses and report the power every minute through an XBee link. But now I live in a small town and my house electrical system is somewhat “old”. My power meter comes from somewhen in the 60s (maybe not so old). So a non-invasive current sensor makes a bit more sense (ehem). This entry was posted in Projects and tagged burden resistor, current, current clamp, current transformer, energy monitor, lowpowerlabs, moteino, open energy monitor, oshpark, rfm69, rfm69gw, shield, xbee on December 14, 2016 by Xose Pérez. 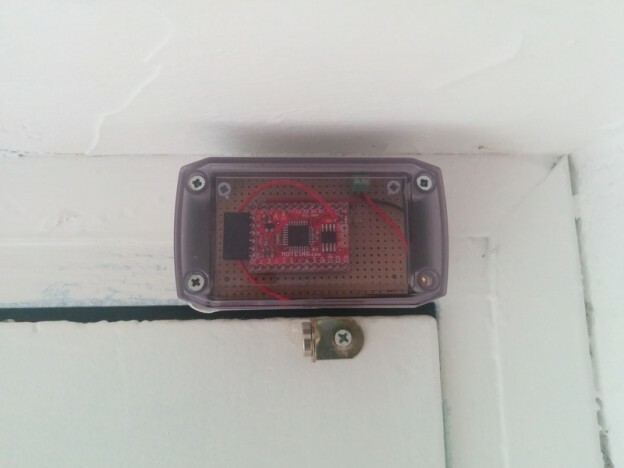 A few weeks ago I wrote about my new door monitor. It was the first step towards migrating my XBee based wireless sensors network to RFM69 radios using Moteino platform by LowPowerLab. I was truly impressed by the low power consumption so I committed myself to keep on working with them. Coincidentally Felix Russo, the guy behind LowPowerLab, released the new version of it’s Weather Shield for Moteino. So it was time to update (or completely revamp) my trusty Arduino FIO based weather station… and last week I received a parcel from LowPowerLab with a pair of shields to play with: the new WeatherShield R2 and the PowerShield R3. They are both compatible with the Moteino (off course). This entry was posted in Projects and tagged adafruit, arduino fio, atmega328, battery, bme280, BMP085, bmp180, bmp183, dso nano, flash, lipo, lowpower, lowpowerlab, mosfet, moteino, powershield, rfm69, rssi, si7021, solar panel, sparkfun, ucurrent gold, weathershield, xbee on October 10, 2016 by Xose Pérez. Aside from using a Moteino and a RFM69 868MHz radio instead of the XBee, I have reduced the components list by moving hardware logic to software logic. This means using sleeping capabilities of both the ATMega328 and the RFM69 and coding in a clever way to reduce awake time. This entry was posted in Code, Projects and tagged ack, atc, auto transmission control, battery monitor, cr2032, debounce, dso nano, esp8266, fritzing, low power, lowpowerlab, magnet, moteino, MQTT, power measurement, reed switch, rfm69, rfm69gw, ucurrent gold, xbee on August 26, 2016 by Xose Pérez.